For starters, PSM will be getting better. Yes, I know it's not bad, but now the traditionally troublesome launch period is over, we can get on with tweaking the mag and making it better. Alongside this, we'll be spending a lot more time updating our web site (http://www.futurenet.co.uk). So far, we've had to put this on the back-burner while we get the magazine out, but when we return, bleary-eyed and hung over in the New Year, we'll be making sure PSM's home page is a hot bed of news, gossip, tips and reviews. Of course, 1996 is going to be the year of the Playstation. There are some major titles heading to your console over the next 12 months, which should put to rest any worries you had about the competition. The Playstation and PSM have only just started!" "Bar a few minor niggles this is a perfect blend of top-rate graphics and slick gameplay. Technically excellent, and deliciously playable, Actua Soccer delivers the lot." "Structurally the game is put together pretty well, but the high difficulty level makes it frustrating and the graphics don't push the Playstation one jot." "A challenging combat game that only reveals its depths with time. Not really recommended for beat 'em up beginners or those with sausages for fingers." "A stunning, moody, captivating tale of evil-doing. But even on three CDs it's way too short, and way too easy. We would dearly like to rate it higher..."
"Gameplay counts for a lot, and this combines tasty strategy and spicy action in pleasing measures. Sprinkle with a soupcon of story and garnish with real-time tension." "If Wipeout hadn't completely cornered the racing market, Hi-Octane might have led the field. Unfortunately, Bullfrog's offering just isn't up to speed." "A slick and rattling good shoot 'em up. No, it ain't original, yes, the FMV bits are damned great. You might finish it with ease but you'll play it again." "Great looking, addictive, and destructive, with a distinctive viewpoint, but let down by dodgy controls and little exploitation of its enormous 3D potential." "An endearing platform game which, though predictable and derivative, still provides some great family entertainment. A welcome addition to Playstation." "A formulaic racer, immediately presented for the next generation. You will enjoy the thrills and indeed the spills, but it becomes dull sooner rather than later." "This game's a decent shooter and very easy to get into, but there's very little variety and the challenges, while difficult, are far from complex. It's all too basic." "More than an arcade game and not quite a flight sim, this game dumps ultra-realism for fast and addictive gameplay. It's an adrenaline rush, pure and simple." "A lovingly crafted basketball sim and a joy to play. It's the slickest sports game for the machine, and as such, recommended almost without hesitation." - Spot the blatent mistake in the first paragraph of the editorial (sorry, I'm thin on trivia for this issue). - Playstation 2 rumours already! "...one theory doing the rounds is that Playstation 2 will be an on-line gaming system." - This was the first issue to feature a tips section. 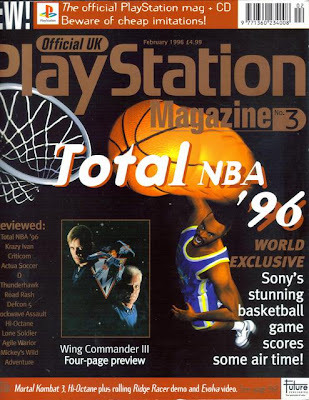 Future Publishing would later release The Official UK Playstation Tips Magazine.